These words introduce Waterkloof’s Circumstance Cape Coral, a Mourvèdre based Rosé named after its colour. This dry, medium bodied wine with berry flavours encapsulates what the Waterkloof Wine Farm stands for. The Blowing Man logo on the bottle was inspired by Boreas, the God of the North Wind and is a constant reminder of how the circumstances on the slopes of the Schaapenberg in Somerset West contribute to their fine wines - and challenges them at the same time. With an entrance reminiscent of a scenic race track - and a view to gasp at once you get to the top -Waterkloof Wine Farm in Somerset West brings enough reason to venture into the Somerset Winelands. 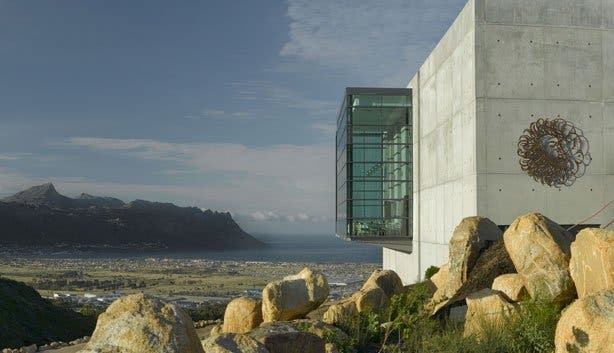 A 360 degree fireplace and impressive new world architecture, a fine dining restaurant and a French style wine philosophy of biodynamic winemaking are the highlights of Waterkloof. As with most things in life, making wine is highly influenced by the circumstances in the area where the grapes are grown, known as the specific terroir. 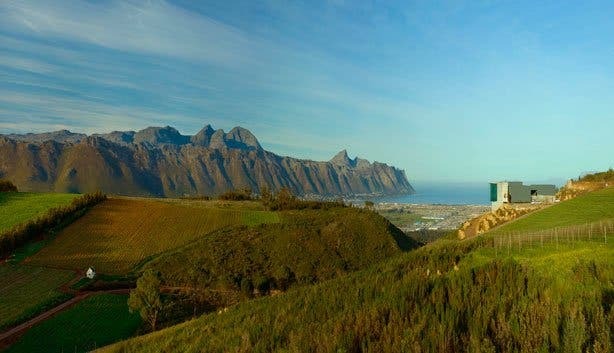 The close proximity to the sea, the wind, the soil quality and the Mediterranean climate all play a role in the end result of Waterkloof wines. In fact, these circumstances can easily be compared with that in Provence, from where they draw their inspiration for natural farming practices. In order to ensure that the soil on the Sir Lowry’s Pass wine farm just outside Somerset West is of the best possible quality, Waterkloof follows organic and biodynamic vineyard processes. These practices are widely used in France with the long term goal of letting the earth and the soil regenerate themselves to increase the immunity of the vines. The vines are therefore hardier and healthier and can more easily withstand disease such as mildew. Horses are used in the vineyards to further work with the soil and can be found strolling around in the vineyards. 50 of the 120 ha estate is planted with vines. The rest of the estate is indigenous fynbos which helps to bring back all the natural organisms that protect the earth. Waterkloof Wine Farm has been awarded BWI (Biodiversity and Wine Initiative) Champion status which means that they are officially accredited for their biodynamic farming practices that help improve the quality of the grapes. Farming in this way means that the grapes are smaller with thicker skins. This helps with the fruit extraction and elegance of the wine, while it also adds tannins, letting the wines age better. This all sounds quite rustic and yes it takes longer to make a premium product. Waterkloof Wine Farm uses a gravitational cellar, meaning the juice is not forced out of the berries, as well as open top fermenters which naturally regulate temperature. This ensures that the grapes start fermenting in a natural way, on natural yeast. After fermentation the wines are further matured in 600l demi-muids (French oak barrels). Very old fashioned? Waterkloof Wine Farm makes wine according to the classical French style. This is because French wines are still the most sought after wines in the world and the focus is to make wines that can compare with the best in the world. No wonder then that you find the Cape Coral Rosé as far as Harrods in London. This classical style of winemaking ensures fantastic food wines, which are elegant and has length. Waterkloof exports most of their wines, but they are also available for sale at the tasting room, which is open every day from 10am until 5pm. 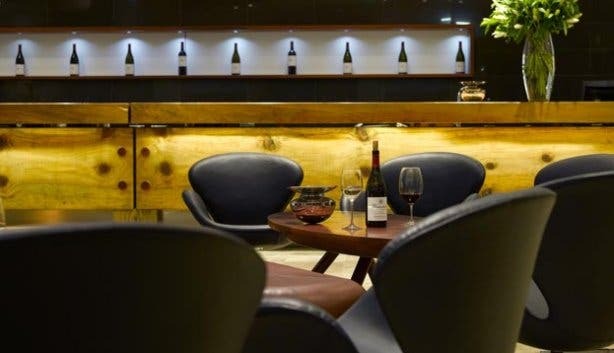 The tasting room is situated inside the 120-seater fine dining restaurant, in a glass house on the slope of the Schaapenberg. In fact the 15m high glass building was quite an architectural and building challenge. The imposing presence is quite startling once you get around a certain bend on the winding road through the equestrian estate and the vines. The challenge for Australian architect Mitch Hayhow was to create a structure that could sit on a slope, while the builders struggled to manage with the cranes in the high winds. What could they do but the best that circumstances would allow? The concrete and glass structure is first functional and then fancy. Very fancy, in fact. Today a grand steel fireplace designed by Frank Bohm dominates the space and while it adds an interesting visual focus it also should keep things nice and cosy throughout winter. The receiving end of Waterkloof’s gravitational cellar can also be seen inside the transparent glass house. 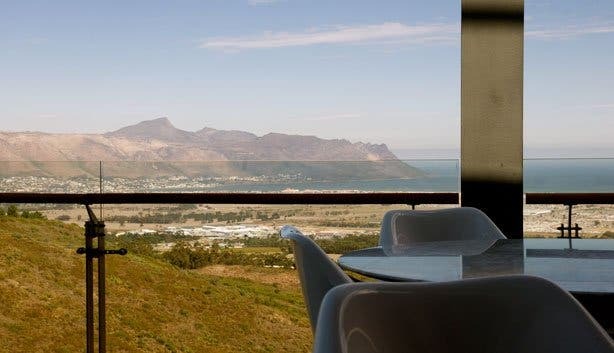 The view of the False Bay expanse adds a fitting backdrop to a glass of Cape Coral Rosé. 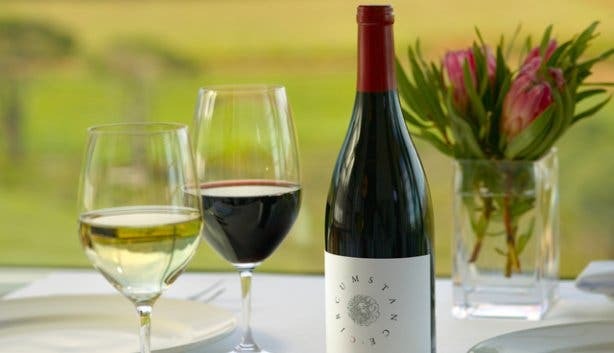 The special wine tasting at the estate costs a mere R30 per person for tasting five of their best wines, including goujère, a French choux pastry traditionally enjoyed with wine tastings in France. This is made by Chef Gregory Czarnecki, who also wows diners with his South African influenced French cuisine at the Waterkloof Restaurant. The wine tastings at the Somerset West estate can be done daily until 17:00 so it’s just the place to go if you’re visiting the Winelands and looking for a special wine estate on a Sunday. It also fits snugly on your list of wine estates with fireplaces in winter. There’s a helipad if you prefer to do your wine tasting and lunch celebrity style by flying to the wine estate via helicopter, or arrange a horseback tour with Orion’s stables and get a wine tasting and Ploughman’s platter at the lapa. There’s even the possibility of hosting events such as weddings or fashion shows here. Interested in discovering Gregory Czarnecki’s French cuisine with local flavours? 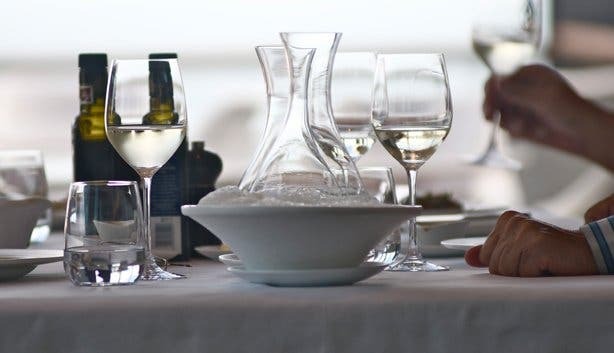 Find out more about fine dining at Waterkloof restaurant.